At TME we report annually on our sustainability actions and results. Our 2014 Sustainability Report is our eighth Report, and our first in a digital format. At Toyota Motor Europe, we have been reporting on our environmental performance since 2001, and publishing an annual Sustainability Report since 2007. This is our eighth Sustainability Report and our first in a digital format. Our 2014 Report covers TME’s environmental, social and economic performance for the financial year 2013 (FY13) from 1 April 2013 to 31 March 2014. We report on the 15 priority issues identified in our FY12 Materiality review, and on a set of KPIs developed and maintained by our CSR Committee. The Report has been prepared by the Corporate Planning Department. A dedicated network of people in our company contributed to the report by providing high-quality, accurate and transparent information. We thank them for their ongoing commitment and support. Our 2014 Sustainability Report is presented online across this website. In the Sustainability tab you will find the core Report information on our Sustainability strategy, approach and performance highlights and data. This includes our Always Better Lives approach to sustainable growth, and its three components: Always Better Cars, Always Better Society, and Always Better Business. For each of these, our approach and FY13 highlights are reported, together with case studies on our commitment in action. Additional details on our approach to our priority Sustainability issues, such as Environment, Safety, and alternative powertrains, are provided across this website, as we aim to report in a more interactive way to better respond to the needs of our stakeholders. While core information and policies will be updated with every new report, case studies and examples will be continually updated to always provide the most relevant information. The environmental performance data in this report is gathered from internal reporting procedures. The methodology used is in line with the Greenhouse Gas Protocol of the World Business Council for Sustainable Development and the World Resources Institute. The social performance data is from formal statistics on customer relations, product quality, safety, health and human resources. The economic data comes from the finance group and is fully in line with corporate annual reporting procedures. The data for our manufacturing plant, Toyota Caetano in Portugal (TCAP), is not covered in this report, because it is a joint venture in which Toyota Motor Corporation has a 27% share only. From this year onwards, data from our operations in Russia will be included in our reports, as they now fall under the responsibility of TME, after a reorganisation in which Toyota Motor Manufacturing Russia LLC (TMMR, the manufacturing plant in Russia), OOO ‘Toyota Motor’ (TMR, the National Marketing and Sales Company in Russia) and Toyota Logistics Services LLC (the logistics company in Russia) completed the process of merging into one company on 30 December 2013. The single remaining company is now known as OOO Toyota Motor. Here you can find the key performance data for TME activities in FY13. All the data has been gathered according to internal reporting procedures, in line with international accepted standards. To ensure our sustainability reporting is useful and reflects the issues that matter to our stakeholders, we conduct a Materiality assessment every two years. During 2013, we consulted with internal stakeholder representatives and validated the outcomes of our research with a group of TME business leaders. As a result, we identified a set of 15 core issues that we believe are the most important sustainability issues for our business and stakeholders. These issues were used as the basis for our previous Sustainability Report 2013, covering FY12, and for our latest Sustainability Report 2014, covering FY13. We started the 2013 Materiality review by assessing the sustainability issues that our competitors in Europe prioritise for their business and stakeholders. 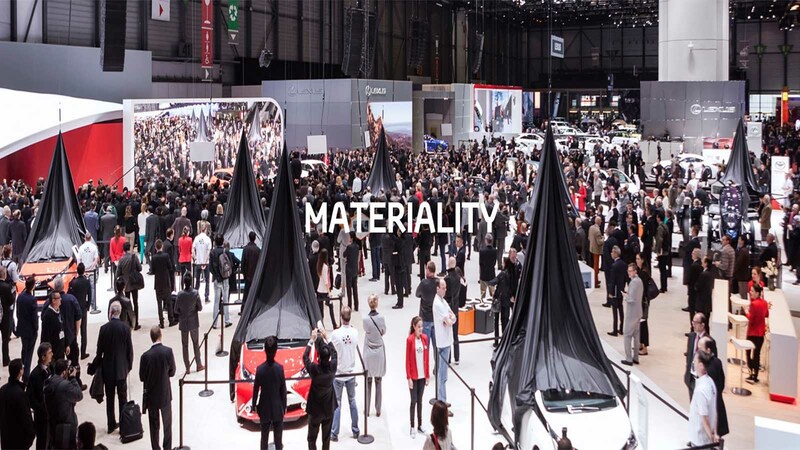 Additionally, we explored current and emerging industry trends around sustainability as identified by our peer groups, including the European Automobile Manufacturers Association, CSR Europe, and the Automotive Industry Action Group. The resulting long list of issues indicated common trends among competitors and industry associations, as well as highlighting the different approaches that other companies take. Working with our reporting partner, Salterbaxter, we then streamlined the long list down to a master list of prioritised issues to create the final basis for our assessment. 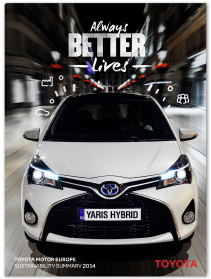 Separately we selected internal respondents, as best placed through having frequent contact with stakeholders in their business, to accurately represent the views of Toyota’s six stakeholder groups: Customers; Employees; Business Partners; Investment Community; Society and Environment. We provided each respondent with the same questionnaire and a list of the prioritised issues, and asked them to identify the top five issues of importance for the stakeholder group they represented. As some groups contained more participants, we used an average response for each stakeholder group in the analysis. The findings of our questionnaire provided a basis for TME’s business leaders to verify the value judgements of our stakeholder representatives. During a validation workshop in August 2013, a group of TME business leaders were presented with the prioritisation results and analysis for the six stakeholder groups. The workshop enabled the team to discuss and agree on a useful list of priority sustainability issues which incorporated their business perspectives. This validation by the business was a key part of our sustainability issues assessment process. From the original long list of prioritised issues, our stakeholder representatives prioritised the 20 most important issues for their stakeholder groups. By including the business perspective from the validation workshop, a refined list of 15 issues was agreed. It is shown here mapped to the three areas of our strategy: Always Better Cars, Always Better Society and Always Better Business.